Complete your rustic chic dining room with this Reclaimed Barn Wood X-Trestle Bench. Create new elements with the mix of fabric chairs and a barn wood bench to give you an urban farmhouse look. Handcrafted by our talented Amish Wood Workers from century old Reclaimed American Barn Wood. Don't worry about that extra chair when your daughter's friend comes to dinner, this is a great space saving solution for extra seating. 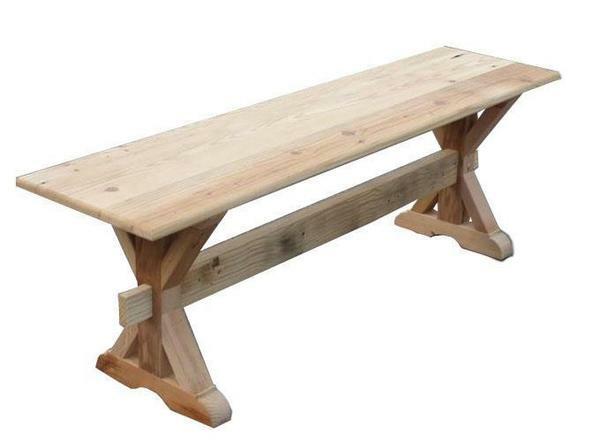 Complete your dining room set with this Amish Reclaimed Barn Wood X-Trestle Bench.